This means that non-profit organizations put a premium on efficiency. It’s impossible to improve donor loyalty without efficient processes. Major donors analyze fundraising efficiency before committing big sums to important causes, and they’re looking for efficiency percentages in the 90s. All donation-based non-profits need to dedicate part of their infrastructure and resources to gathering donations. They also have administrative processes and costs that no one can avoid. When a non-profit commits itself to high-volume, low-impact processes – and then entrusts them to salaried employees – efficiency drops. A non-automated workforce can only produce a fraction of the productivity that a fully automated workforce can. Workflow automation extends to nearly every aspect of the non-profit enterprise. Half a century ago, solicitation by telephone represented the cutting edge of communication technology for non-profits. Today, it’s the smartphone – but you won’t get many donations by staffing a call center and calling potential donors. Instead, non-profit executives need to build automated solutions that simplify the donation process. For example, the Red Cross uses an automated text-message donation system. Solutions like these can boost efficiency and productivity at every level of the non-profit structure. But automation isn’t just useful for attracting donations. Workflow automation truly delivers results on the inside of the organization. 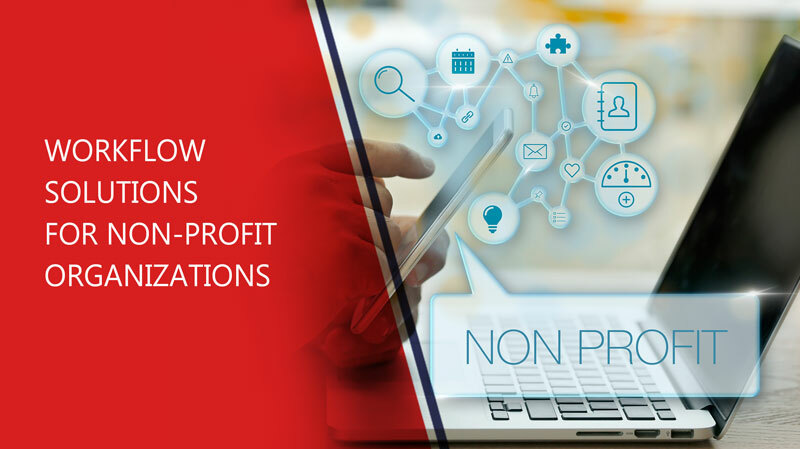 Some of the most important cost-cutting benefits of workflow solutions for non-profits occur in administration and accounting. Sophisticated office equipment and advanced mobile solutions can allow non-profits to streamline their purchasing and verification processes. For instance, automated workflows can allow non-profits to save time, money, and paper on fund accounting. With an automated purchasing workflow in place, non-profit decision-makers can enjoy deep visibility into purchasing requisitions on their mobile devices in real-time. This means that the system could generate notifications for vendor payments and send them directly to mobile devices. The user would then only need to confirm the transaction – a one-click operation – and it’s done. The system would then prepare the appropriate invoice and report, replacing what would otherwise be multiple manual processes that would take days to complete. Auditing is another area where workflow automation is a powerful tool. Instead of having every department spend time and energy producing reports and documents, an automated dashboard can offer real-time data on every aspect of the non-profit enterprise. Workflow solutions for not-for-profit organizations are key to reducing the costs associated with accountability and visibility. These solutions transform the organization into a modern, streamlined workplace that accomplishes complex tasks with ease. Print processes are another area where non-profits consistently spend more time and money completing tasks than they need to. In an efficient office environment, paper-oriented processes are streamlined to meet the needs of donors and scaled back for employees and managers. In most of these environments, ad hoc print processes lead to expensive inefficiencies like rampant paper use, consumable waste, and printer downtime. If an employee uses the very last ink or toner cartridge to complete an administrative process, that printer will hold back every other employee from finishing their job until an IT specialist comes and addresses it. If the printer breaks or malfunctions, the entire office may have to wait days for the situation to improve. Non-profits need to invest in managed print services that reduce their reliance on in-house expertise and expensive printer service calls. Managed print services give non-profit organizations access to scalable, affordable print expertise on an on-demand basis. Printer uptime is guaranteed through the service-level agreement and in-house IT staff is free to focus on higher-impact tasks that serve donors’ needs more directly. Xerox office solutions include cloud-based printer fleet management software that improves document communication throughout organizations. Xerox ConnectKey helps non-profits secure their print processes and reduce paper waste while scanning and copying documents directly to popular cloud storage services. All these technologies play a role in developing best-in-class workflow solutions for non-profit organizations. Office technology expertise is critical for implementing them correctly and keeping the system running smoothly. Your non-profit organization needs best-in-class workflow automation to maximize efficiency. Talk to a document management expert at Zeno Solutions to find out how we can help!